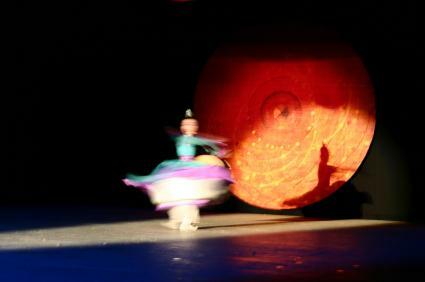 Korean court dance is one of the oldest performing arts known to man. While many of the dances have been lost over time, cultural groups still preserve their beauty in modern times. The Korean word for this art is "cheongjae", which means "display of talent." The dance was very popular in the courts from the tenth through the fourteenth century, but since that time much has been lost in terms of choreography. Only about fifty dances are still performed, and only a single one of these, the "Ch'unaengjon" or "Nightingale-Dance" has precisely recorded steps. One of the Korean dances that survived into modern times is the "Mu Go". This dance has two groups of dancers dressed in either green or purple-hued costumes. They dance around a large drum in the center of the dance floor, occasionally reaching out to strike the drum with extensions called "hansam" hidden in their sleeves. The choreography leads some dancers to circle close to the drum while the other group moves more to the edge of the dance floor. Like many dances, the moves are slow and stately, following a dignified style in keeping with Confucian precepts. As might be gathered from the descriptions of the dances, many of the performances included props, such as fans with images of dragons, phoenixes, or peacocks. Flowers such as the lotus or even a plantain were also common elements. Not all the dances required props, though. The Ghost Dance, for example, is not a scary story, but rather depicts the poignant sweetness of two lovers separated by death reunited briefly before having to say goodbye again. Another function of Korean court dancing was religious. The Ch'toyongmu is performed by a solo dancer wearing a red mask (thought to ward off evil spirits). This dance was done at the end of the year as a kind of exorcism, with a black costume except for the headgear of a courtier. This is the only historical court dance with a mask, although many folk dances use them. Other dances tell stories, such as Ch'unaengjon, created by a Crown Prince of Korea. It survives today as "The Nightingale Dance" and describes the simple idea of an Emperor hearing the beautiful song of a bird and asking his court musician to record it as a song. While the song itself was later added to the dance, the important part of the story integrates poetry into the dance, expressing that the spring nightingale reminds the prince of his lover, the "loveliest of all." Korean court dance was performed for the ruling bodies, for visiting envoys, or during holidays and festivals determined by the government. Unfortunately, during the 20th century, under Japanese rule, many dances were lost as those who knew them were killed or not allowed to pass on their knowledge. Many dance historians and cultural groups are working to restore the dances both in Korean communities around the world and in universities. While sources such as the Facebook Korean Dance Page can give a useful overview of the art, most of the serious research and preservation of this art form is done in academic circles from Hawaii to Wisconsin. At the same time, artists such as Peggy Myo-Young Choy are integrating Korean court dancing, folk dance, and contemporary choreography into entirely new forms. Due to this dedication and passion, the dances of Korea have survived to enrich the dance community throughout the world.